(Bloomberg) -- Inmarsat Plc rose as much as 12 percent after the British satellite company last week said it had rebuffed a takeover proposal from EchoStar Corp. The stock rose 11 percent to 525 in early trading in London on Monday. 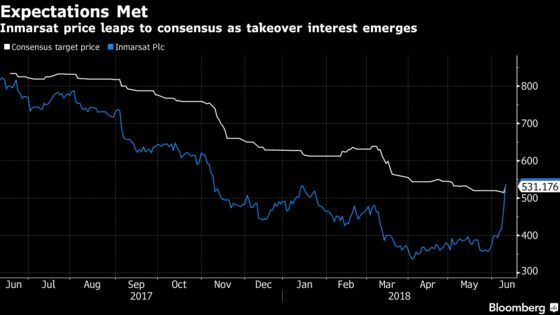 The statement from Inmarsat on Friday followed a 13 percent surge in its shares, the most in a decade. Inmarst management must hold out for a higher offer, Jefferies analyst led by Giles Thorne said in a note to clients. Inmarsat sees aviation services as its biggest growth driver in the coming years and is also seeking to diversify into businesses like connected cars, after coping with a protracted slowdown in the shipping industry. The company is also facing new competition in the shipping business, its biggest revenue generator, after U.S.-based Iridium Communications Inc. last month won regulatory approval to start offering services from 2020.